Drag & Drop is a common feature that grabs an object and drags it to another location. In HTML5, drag and drop is part of the standard, and any element can be dragged and dropped. In the past, we used the Mousedown, Mouseove, Mouseup and other events of the mouse to constantly acquire the coordinates of the mouse to modify the position of the element. 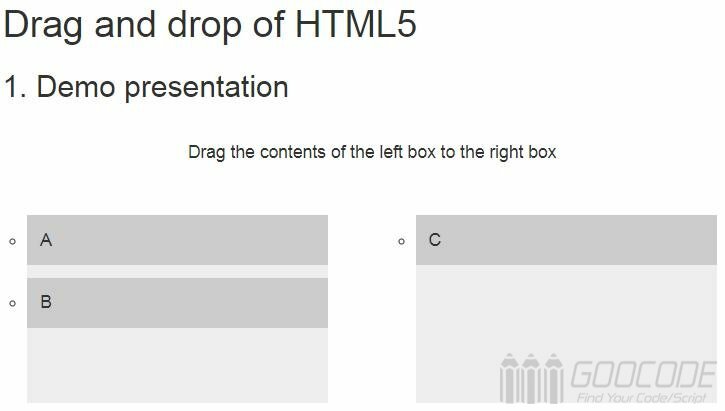 Now the html5 native Drag & Drop event (DnD) is convenient and the performance is improved. Internet Explorer 9+, Firefox, Opera 12, Chrome, and Safari 5 support drag and drop. Note: In most browsers, the a element and the img element are drag and drop by default, but for security reasons, it is best to add the draggable attribute. Dragstart: Triggered when a web page element begins to drag. Drag: The dragged element is continuously triggered during the dragging process. Dragenter: Triggered when the dragged element enters the target element, the event should be listened to at the target element. Dragleave: Triggered when the dragged element leaves the target element, the event should be listened to at the target element. Dragover: The triggered element continues to fire when it stays in the target element. The event should be listened to at the target element. Drap: The dragged element or the file selected from the file system, triggered when dragged and dropped. Dragend: Triggered when the page element is dragged. Note: All of these events can specify a callback function. During the dragging process, the event parameters accepted by the callback function have a dataTransfer property. It points to an object that contains various information related to dragging. The above code stores a text message on the dataTransfer object at the beginning of the drag, the content is "Helloweba". When the drag and drop ends, you can use the getData method to retrieve this information. effectAllowed: Specifies the allowed operations. Possible values ​​are copy, move, link, copyLink, copyMove, linkMove, all, none, and uninitialized (default, equivalent to all, which allows everything). Files: contains a FileList object, which means that the files involved in drag and drop are mainly used to process files that are dragged into the browser from the file system. Types: The type of data stored in the DataTransfer object. setData(format, data): Stores data on the dataTransfer object. The first parameter format is used to specify the type of data stored, such as text, url, text/html, and so on. getData(format): fetches data from the dataTransfer object. clearData(format): Clears the data stored by the dataTransfer object. If the format parameter is specified, only the data in that format is cleared, otherwise all data is cleared. setDragImage(imgElement, x, y): Specifies the image to display during dragging. By default, many browsers display a translucent version of a dragged element. The parameter imgElement must be an image element, not a path to the image, and the parameters x and y represent the position of the image relative to the mouse. The dataTransfer object allows data to be stored on it, which makes it possible to transfer information between the dragged element and the target element. In the example, we set to drag and drop elements from one box to another. #drags is the object box being dragged, and #drops is the target area box. //The target element listens when the dragged and dropped element falls. Note that we want to call preventDefault() to avoid the browser's default handling of the data (the default behavior of the drop event is opened as a link), in addition to getting the dragged data via the dataTransfer.getData("Text") method. This method will return any data of the same type set in the setData() method.